The first two days of the Conference were amazing, and still, more great things to look forward to on Day 3! 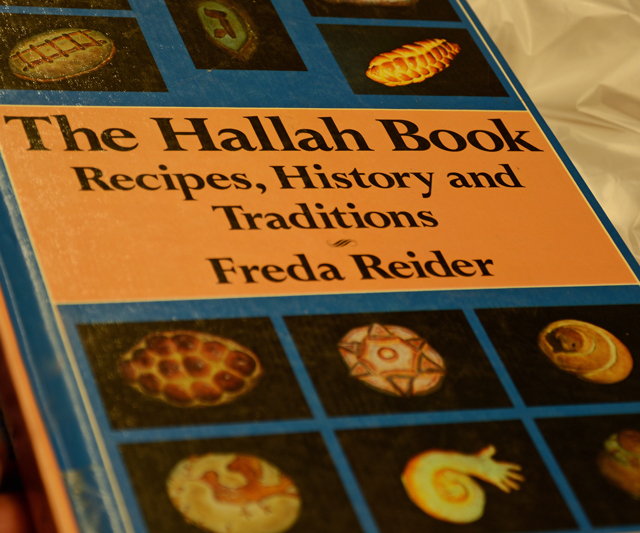 Andrew Meltzer demonstrated his amazing braiding skills!, showing us some beautiful ways to braid 100% whole wheat Challah dough, and brought an interesting book to about Challah traditions to class. 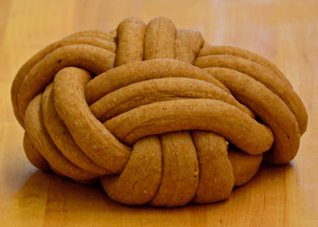 Andrew recommended practicing with boat rope, and when working with live dough, to ensure the braids are a little bit loose, to give the braids the right amount of space and tension, so they proof evenly. For a 3-strand braid, you take a strand from the outside and place it between 1 strand on the left and 1 strand on the right. That pattern is similar for the 7- strand shown above; you take a strand from the outside, moving it over 3 strands, placing it between the 3 strands on the left and the 3 strands on the right. That 7-strand braid was one of my favorites. 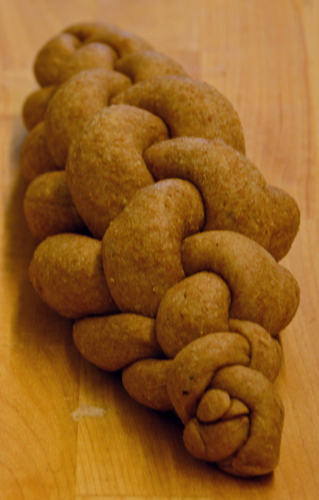 Here is the completed braid, before baking, and another photo of it baked. Andrew told us how he egg washes Challah, to get the best shine. The egg wash is made of 1 egg + 1 egg yolk, a pinch of salt (to help break up the egg) and a few drops of water, whisked with a fork and left to sit for a little while. When the bread is almost proofed all of the way, brush with 1 coat of egg wash, let the first coat dry (this is the key), then apply a second coat, then bake. Andrew said it is the 'wet over dry' that makes the crust shine. 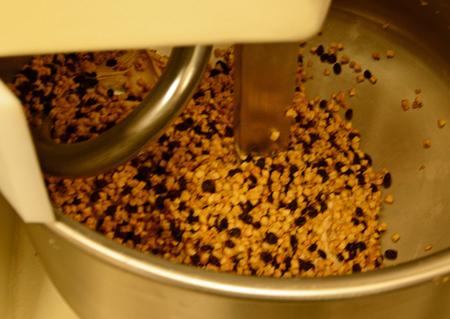 He also described a neat way to apply seeds alternately to egg-washed braids,: wet your thumb and press into a tray of seeds, then press your seed-coated thumb on the egg washed loaf, placing the seeds exactly where you want them. The seeds should transfer from your thumb to the loaf. Repeat with different colors/textures of seeds. Didn’t Andrew do a beautiful job braiding these breads? It was a tremendous pleasure to taste one of the breads Jan Schat baked (he baked three versions of the same bread, testing out three local wheats: an Oregon Hard White, an Oregon Hard Red, and a Washington Hard Red). Jan’s bread was absolutely delicious, the one I tasted made with Fairhaven’s Hard Red wheat, sour and sponge preferments, and 60% fruit (30% raisin and 30% dried apple). 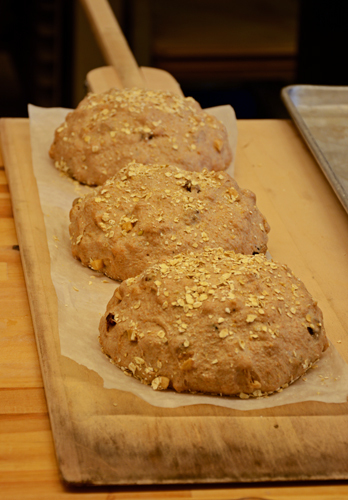 Another tasting pleasure was the Fig and Anise bread created in Martin Philip’s class, "Signature Breads". the resulting bread having beautiful flavor. This Conference concluded with tours – I toured the WoodStone oven manufacturing facility in Bellingham. They make some really nice ovens, for home use too! and the test kitchen is really beautiful (cookbooks and cooking vessels galore, a great big mixer, those ovens – I could really have fun in a place like that!). I was able to pop into BreadFarm bakery for a quick tour, too, and pick up some delicious, fragrant loaves to bring home - that bakery is not to be missed if you are ever in the area (it's located in Bow-Edison, WA). it was so wonderful to be able to go. I’m really looking forward to next year’s event! Previous posts: Day 1!, Day 2! I just finished reading all of your posts on the conference plus Floyd's followed by Rossnroller piece about the classes Derek is teaching 'down under'. 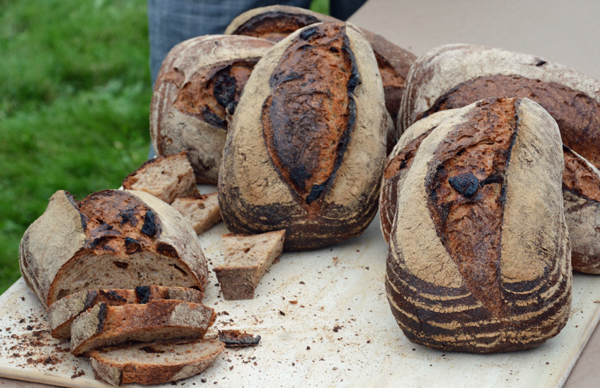 Pretty exciting stuff to see all the enthusiasm out there going into creating good bread. Real 'grass roots' based on pure love of quality bread that seem to be gaining momentum across the country/world- at least from what I read here by contributors throughout the world. So much to learn and to try to create through educating people ….how far we have drifted as a society…hopefully all of these efforts will pay off as more become aware of what good bread is and how easy it really is to bake good wholesome bread. I am very happy you enjoyed the posts - thank you! (I've updated my Day 1 post to include links to posts about the Conference, contributed by others, and updated this one to add some other good things Andrew offered about Challah breads). Amazing stuff. I couldn't help but drool a bit with the list of all the different grains. Would be nice to get variety back in the wheats that are available throughout the country. It is nice to see the list growing and that the public is demanding these grains. I am waiting to see if I can get my hands on any Turkey Wheat this fall. I know their supply sells out really quickly and that they are all out now…patience. Thanks again for all of this. Nice to see that MC with a smile on her face and surrounded by good bread friends and good bread! I loved your 3 posts. Felt like i was there and very sad I wasn't.Now to make one of those tin can concrete and clay tandoor ovens. I'm addicted to naan. Yhanks for the great posts. Here's hoping you can make the journey to the Conference next year. If you make your own tandoor oven, please do post about it! Naomi mentioned how to condition the clay: finely-chopped spinach is mixed with yogurt, this mixture spread over the clay, and then it is baked off. A pleasure to meet you. Your photos are beautiful and summaries appreciated, they bring back the memories. 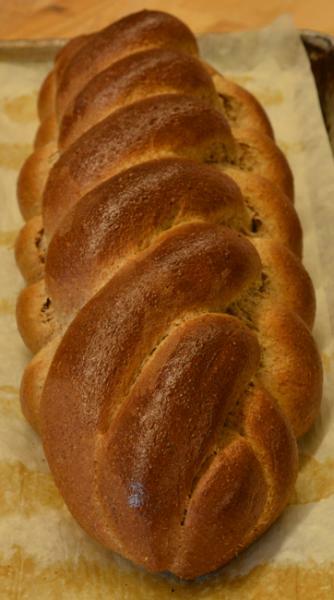 I was surprised how delicious the whole wheat challa was. 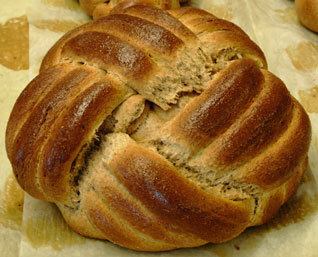 I think there are so many more tasty breads, but using the whole wheat in the challa put it on my list of future breads. Beauty and flavor. I hope I see you again at next year's Conference or another nearby baking class or event. I appreciate your flavor report on the whole-wheat Challah - I regret I didn't get to taste it. I'm grateful for the many beautiful, flavorful breads I was able to taste and excited to try Andrew's formula, practice the braiding techniques he taught, and taste this bread for myself. Thanks so much - and I was glad to read the report Ross wrote of the baking class you taught in western Australia! The students were lucky to taste those gorgeous breads, and to learn from an experienced baker like yourself. So generous of you to share your knowledge with your students - I'm very grateful to all of the instructors at the Conference, who were so willing to share their knowledge about their craft. Great write-up, Breadsong! Thank you much for sharing all this! Thank you for what you shared, too - I really liked your post about the Conference. to being there. Thank you for sharing, Breadsong. You are so welcome, Paul. Thanks so much for your great report...I wish I could go to one of these one day but your posts are just like being there but only if we had smell-a-vision and taste-o-vision! What beautiful braiding....I am terrible at braiding...guess that's partly due to being 1 of 3 boys and not having any sisters! You're very welcome...here's a picture of Andrew practicing braiding, using pieces of boat rope. ...a good way to get some practice in - I need the practice, too! Thoroughly enjoyable series of posts! Thanks so much for sharing your experiences at this year's KCW, along with your gorgeous photography. It looks like a fabulous way to spend a weekend. Just wish I could have been there to take it all in, along with you and the other folks attending, but your series of posts for the conference are a great way for me to be able to experience them vicariously through your excellent writeup. Thank you so much - so happy you like the posts and photos! I hope next year you can travel down to the Conference - I know you'd have a great time. I do feel very fortunate, being able to go to this Conference, located relatively close by to me. Lots of people travelled great distances to attend, one travelling from as far away as South Africa! 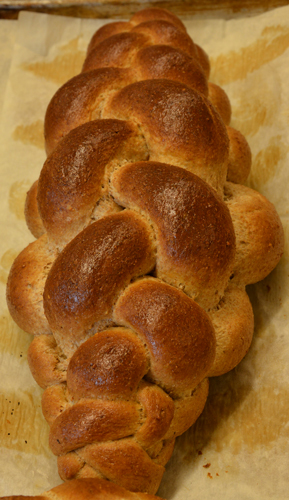 I didn't taste the whole-wheat Challah (sure wish I had, when I had the chance). The dough might look heavy - Andrew did say that due to scheduling, it wasn't fermented enough, but that it would be OK to braid with. The fig and anise bread of Martin Philip's class I did get the opportunity to taste, and it was fabulous! 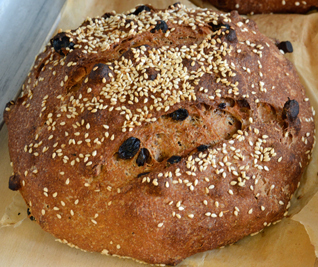 Please watch MC-Farine's blog - she noted in her KCW post she's planning to post more about this bread. How nice to see your lovely photos and read about the conference. I loved the little WFO...just make a mound of sand and cover it with clay, let it dry and dig out the sand. Sounds simple enough. I enjoyed seeing the pizza's getting made and your breakfast looked so delicious. What an enjoyable holiday for you! Thanks for sharing it all so nicely. Yes, the whole thing was very enjoyable, and glad you thought so too! Sorry for the late reply! Sorry for the late reply! Just wanted to say thank you for your thorough posts on the Kneading Conference. It's much appreciated. You are very welcome and thanks so much for your comment! 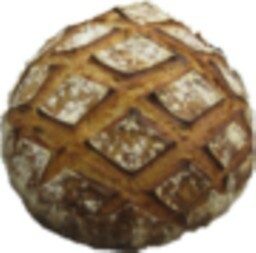 All original site content copyright 2019 The Fresh Loaf unless stated otherwise. Content posted by community members is their own. The Fresh Loaf is not responsible for community member content. If you see anything inappropriate on the site or have any questions, contact me at floydm at thefreshloaf dot com. This site is powered by Drupal.